This comes a little late in the year because I never shared my New Years Resolutions with you all. I was still in Thailand then and not blogging during the holiday to give my brain a break. Well it's since been almost 4 months and I can say my resolutions are going quite well. I don't normally do "resolutions" in the typical way but more like achievable goals to set myself. Below you can read about how the progress is coming along! 1. No online shopping: I know this sounds insane especially since I live in a small town but it is going ok. I find myself realizing my wardrobe doesn't need that thing I would have convinced myself last year I desperately needed. But now I find new ways to wear things in my closet. I am also trying to consciously pare down my wardrobe to staples and essentials. It has taken me a long time to realize that some trends don't necessarily work for me, and that can be especially true of where I live. It's cold and rainy a lot of the time here so I don't have as many shoe or coat options to wear. I still love dressing up and looking stylish, especially since my first love is fashion. I am just trying to do it in a more sustainable way now and easier on the bank account. I can say I haven't bought any clothes online and it's April so I think I am doing quite well with this goal! 2. Start training again: I don't often share with my readers how much I enjoy working out, whether it is yoga, running, workout classes, spin or workouts at the gym. I do all of the above and I find it is not only the best thing for me physically but also mentally too. I have mentioned before how hard it is for me to sleep some nights and I especially find this true if I haven't done some sort of exercise that day. Most of my 20's I spent running over any other activity. It is by far my favourite type of exercise. However, a few years ago I was running a bit too much, doing two races and Tough Mudder in the same year took a tole on my body, specifically my hip. I had to get a lot of massage, chiro, physio and acupuncture to get it back to normal. I still find it bothers me from time to time, but it is way better than it used to be. So this year I decided to sign up for a race, a half marathon here in Ucluelet, to get back into training. It took a lot of time to get back to where I once was, but I finally feel like I'm back to it and loving it. The race is in June so I still have some time to train! 3. Spend more time off my phone and more time on things I love: I think this is a goal a lot of us have set for ourselves recently. Whether it is before bed or throughout the day. I am one of these people that has realized it is affected my well being so I am making a conscious effort to leave my phone alone more now. I obviously have to be on it for this blog, whether it is posting on Instagram or checking out inspiration and taking photos. However, I have made a new rule for myself. I 'unplug' at 9:30pm every night, which means I plug my phone in and don't look at it again until the next morning. This has had a huge affect on my sleep pattern already. I also put my phone away more now during TV time with Dave so I can focus more on what we're watching and enjoy it, rather than looking at two screens at once. Now that I unplug at night I also have way more time to read and I love reading before bed. I have also recently gotten into macrame and have been making pieces for friends to purchase. I am really enjoying getting in touch with my creative side again. Those are my three goals I am working on currently, however, I am always constantly working at others. I will keep you posted on how they are going throughout the year and other goals I have set for myself. Like getting outdoors more and learning to bake new and exciting baked goods. Stay tuned! I know I am a week late with this post, but late is better than never right? This is more of a personal post then I usually do but after feeling so much love last week for International Women's Day I had to do one of my own. I am so lucky to be surrounded by so many wonderful, caring and amazing women. From my mum who reads each and every one of these posts and corrects any mistakes. To my sister who has moved to the other side of the world, which I think is so brave and exciting! Not only are my best friends (who now live quite far away) are supportive, as well as my family but also the women in the town I moved to recently. Each and every woman I have met so far and accepted me into their communities are so inspirational I can't help but be inspired. Thank you to all of you who have let me interview you: Kara, Zoe and Jess. You are all such strong and inspiring women in a community that is small but has a large heart. So thank you to everyone, it has been a journey and I always appreciate all your support in everything I do. Can you believe it's November already? I can't! Before you know it Christmas will be here in no time. I wanted to start a new series with some personal goals for myself. It's hard when I work full time and try to keep this blog up as well to also take time for myself and loved ones. It's been just over a year since I started this blog and I can't believe I am still working on it. I wasn't sure how this adventure would turn out, whether I would hate it, love it, whether anyone would actually read it. It is slowly growing, I am trying to branch out to include my beauty routines, more posts about art (my true love) and get myself out there through social media, which I am finding to be very difficult. Below are some of the things I would like to work on over November, and into December since my holidays are coming up pretty quick! 1. Teach myself a new skill. When I first started this blog, just making a website was a big achievement for myself (if you know me you will understand, I am completely computer dumb.) I would love to make my blog a little more cohesive, something I am currently working on. Easier for people to access the recipes they are looking for or outfits they want to recreate. 2. Read more. This is a big one and probably the hardest for me to do at the moment. Right now my life consists of working full time, working out before or after work (usually after,) writing at least 3-4 blog posts a week and also you know eating, sleeping, spending time with Dave. So reading has definitely fallen on the back burner in my life. I just started a new book (about a month ago though) that I am so excited about and love but still don't find the time to read it. I'm really looking forward to having the time over my holidays to read the whole book and hopefully another! 3. Try a new type of exercise. 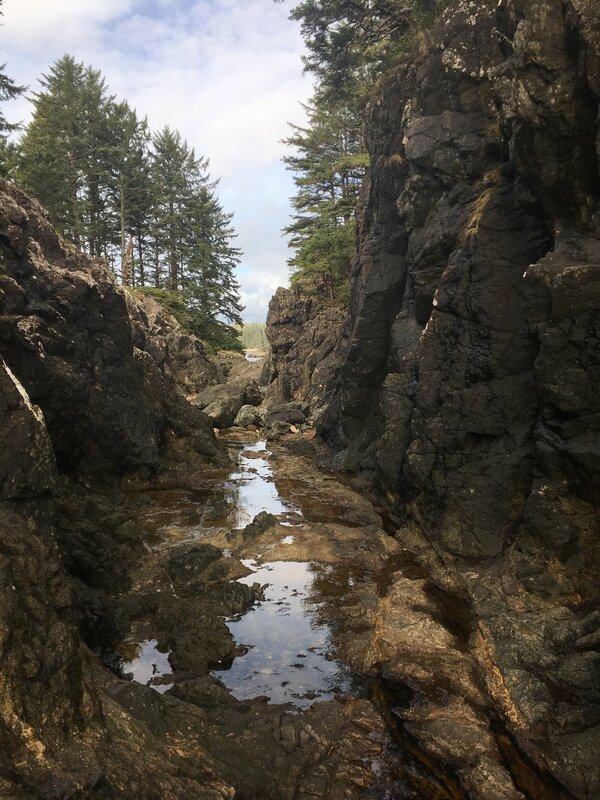 I have been running for most of my 20's and now that I'm living in Ucluelet I find it a lot harder to run here. The hills are massive and kill me and I just can't find a route that I absolutely love. So I decided to sign Dave and I up to try TRX at The Studio with Body By Kara. It's a 6 week program and it starts on Monday and I'm quite excited about it. I find I get bored of doing the same workout all the time and as I get older it is harder to stay in as good of shape so I'm hoping this helps! 4. Plan date nights. As you can probably grasp from my above goals I seem to always be busy these days. Sometimes you can get in a rut of making dinner with your partner and then sitting down to watch TV for the night, especially in the winter. I'm trying to make a point that every time it's not raining out, even if it is dark after work, I make sure we get out for a walk. Or make dinner together, go out for dinner once and awhile. Even getting coffee together on the weekends to break the mundane work week up is important. Do you have any goals for the next month or before the craziness of the holidays begin?